Aviation Updates Philippines - In an effort to provide everyJuan with low fares to their dream places, Cebu Pacific is planning to grow its Davao hub with more direct flights to international destinations. Cebu Pacific recently launched twice weekly flights from Davao and Singapore on Thursday. 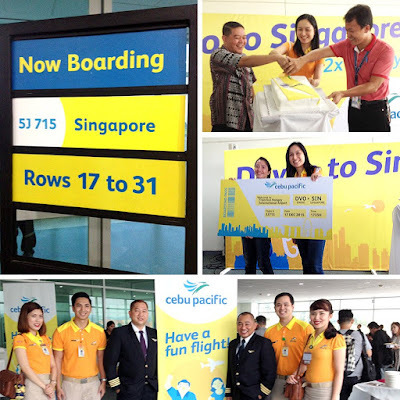 Launching of the new Davao to Singapore route on December 17, 2015. Photo by Cebu Pacific Air. Cebu Pacific Air's Vice President for Marketing and Distribution, Candice Iyog said during the launch that it is just the beginning of launching new international services from Davao. "This is just the beginning of Davao, hopefully depending on how it goes we hope to be able to grow Davao as an international destination; we are always looking at other possibilities," Iyog at the Francisco Bangoy International Airport in Davao City said. Iyog is confident as Davao remains as a foreign hub for ecotourism and eco-adventures. In the coming years, more international flights will be launched from the city of Davao in accordance with Cebu Pacific's commitment which is to connect more island to the Philippines. "Right now we haven't put anything in the plan yet, but what we definitely can look at right now are the international destinations we already have in Cebu and other airports in the country," Iyog said. The inaugural flight of the Davao to Singapore route, operated by an Airbus A320-200 aircraft, carried 150 passengers or 83 percent load factor. The Airbus A320 aircraft can carry up to 189 passengers but Cebu Pacific's A320 is only designed to fly 180 passengers (excluding infants). Iyog said that the airline's goal is to have at least 85 percent load factor on all its flights, so for new services, it should start with a weekly service. After that, the airline can already find more international destinations for Cebu Pacific to fly to from Davao. The Davao-Singapore route was being serviced by Cebu Pacific in 2008. Cebu Pacific revived the route in order to open up the Philippines to other countries, develop travel, tourism and trade, it said. Before the entry of Cebu Pacific to the market, the Davao-Singapore route is only being served by Singapore Airlines' regional subsidiary, SilkAir using its Boeing 737-800 and Airbus A320-200 aircraft. Cebu Pacific serves flights from Manila, Cebu and Iloilo to Hong Kong. However, it doesn't have international flights from their hub in Davao City except the newly launched Davao-Singapore flights.